Guess which joint is the largest in the human body? Guess which bone is the longest bone in the body? One of the reasons our knee joint needs to be so big is that it bears very high forces from the longest bone (and lever) in the human body (the upper leg bone). Since we are dealing with such a large joint and forces, it shouldn’t be a surprise that knee problems are one of the most common injuries in the workplace. 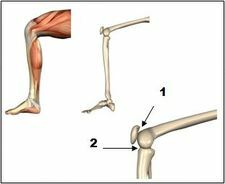 The knee joint appears pretty simple and breaks down into two important joints: The knee cap joint ((#1) between the underside of the kneecap and the bottom of the upper leg bone) and the knee joint ((#2) between the long bones of the leg). The knee joint itself is a balancing act of muscles, ligaments and cartilage. Similar to the back and shoulder, if the joint gets slightly out of balance or one of the pieces of the puzzle are strained, the impact to our daily lives can be severe.